By the time we discovered that she had escaped, Dixie had about a half hour head start. Because she’s never really explored outside, we had no idea which direction she would go. After nearly two hours of searching for her in the dark, my boyfriend and I became very discouraged. I gave Dixie’s food bag one last crinkle to entice her with the familiar sound and all of the sudden – little Dixie trotted up from the street. She was shaking, cold and her little heart was racing. 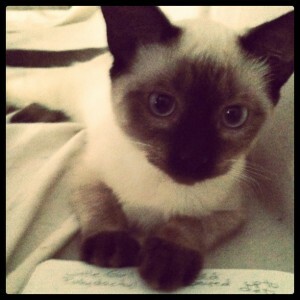 But luckily – my tiny feline friend was home safe! Within those stressful two hours, we discussed what steps we could take to find our lost cat. First and foremost, you need to remain calm. My fuzzy beasts are like my children, so it was very easy for me to get emotional and forget logic. Dixie loves the outdoors, but isn’t familiar with them. Logic says she would come back to her safe home. But my high emotions convinced me that she was going to be missing forever. 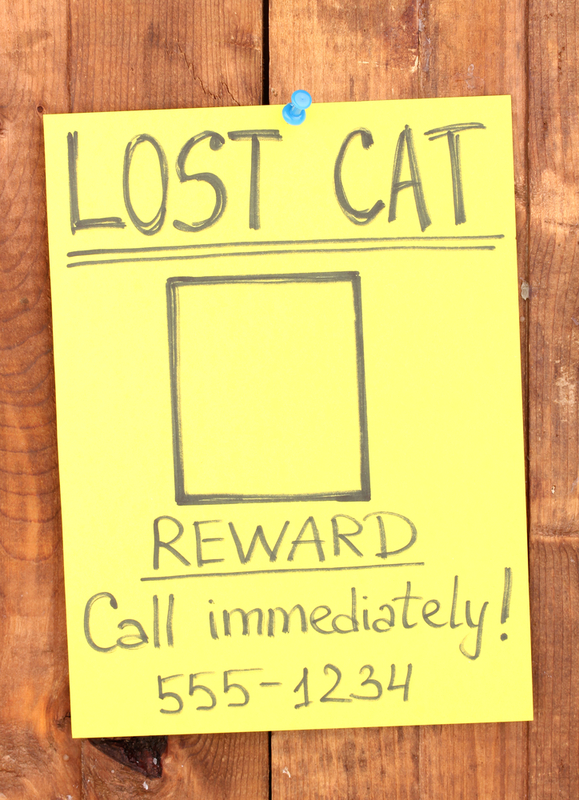 It’s important to immediately start looking for a lost cat. Had we waited until morning to look for Dixie, she probably would not have come back so quickly. The longer you wait, the farther away your lost cat will travel. 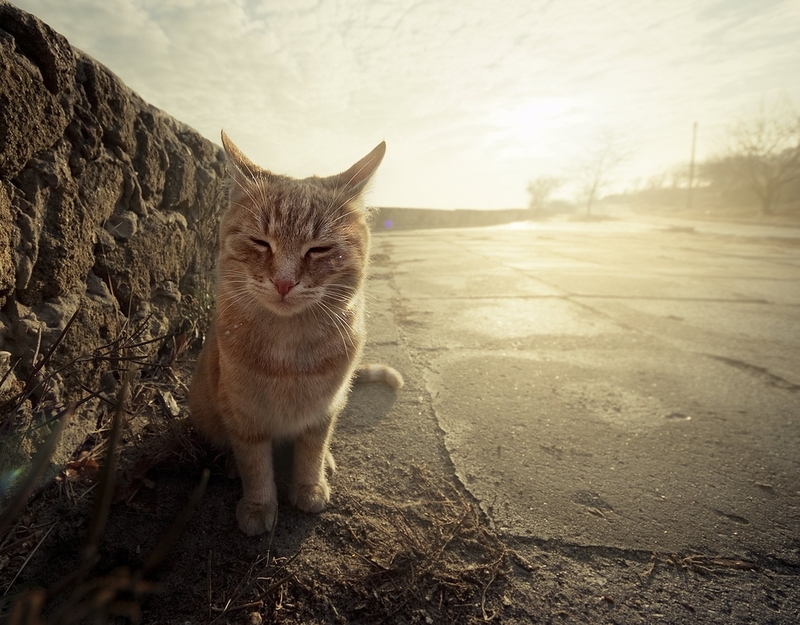 If your cat has ever ventured outside before, even for a short time, think about what direction they usually go. Dixie loves rolling around on cement and gets nervous in grassy areas the few times she’s gotten out, thus we followed our driveway and looked near the street. If possible, knock on your neighbors’ doors. Ask them if they’ve seen your lost cat and ask them to let you know if they see her in the near future. Notify them that your cats are indoor felines, thus if they ever see them to please let you know. Unfortunately, it was pretty late when Dixie got out so we couldn’t notify our neighbors. A man around the block saw me looking in bushes and asked me what I was doing, so I did ask him to keep an eye out for a small Siamese. Call out for your cat and use noisy or smelly items that they love. Dixie loves to eat more than the average feline, so we walked around the area while crinkling her food bag. She also loves our laser pointer, so I jingled the keychain as I looked for her. Sure enough, the sound of the food bag brought her home! Stop and listen frequently. 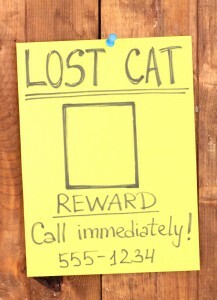 Don’t aimlessly call for your lost cat and keep walking. Tune in to your surroundings for movement or meowing. Dixie meowed as she ran up the driveway, which attracted our attention. We had to further encourage her to come to us. If we weren’t paying attention for her sounds, she may have kept running. Notify helpful reinforcement within the area. Post a message on Craigslist, call the police department, vets and local shelters, ask friends and family on social networks to spread the word, and contact your local Patch.com website. Post signs with a reward. Post numerous signs around the area, in noticeable places. Make sure the signs are easily read while driving and include large pictures. If possible, make the signs waterproof. Don’t specify the reward amount, but be sure to offer a small incentive to encourage others to help you. Place familiar smelling items outside. If you can no longer continue looking at that moment place items that smell like you or your other animals outside. Place food, cat nip, favorite toys or your clothing on your porch. Some experts recommend putting the cat’s dirty litter box outside. 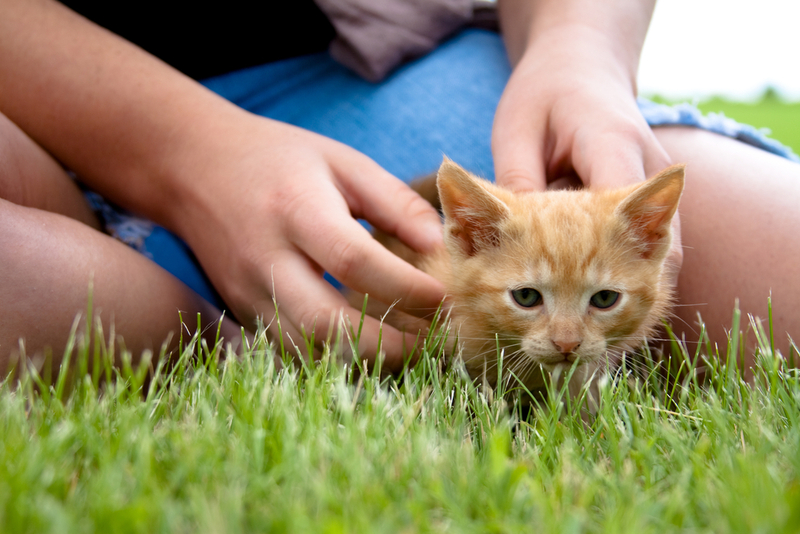 Indoor cats don’t immediately know that they can use the outdoors as a restroom and will look for their litter box. As soon as Dixie got inside, she used her litter box. I am so thankful the Dixie made it home! I will be more careful when letting my dog in/out. And to further aid in keeping her safe, I plan to get her micro-chipped very soon!